Progressive Industries’ history dates back to the late 1950s in Monongalia County as an underground mining equipment repair and rebuild shop. It was a great time to be in that line of work; the coal industry was booming in Monongalia County and across most of West Virginia. Progressive Industries enjoyed decades of steady work. However, being largely dependent on a single industry can leave a company vulnerable when that industry hits difficult times. That certainly was the case for Progressive Industries when West Virginia’s mining industry began to slow down. “Where we had been working on 30 to 40 pieces of equipment a year, we were working on four, and then three,” owner Heather Cyphert said. Consequently, her workforce went from 45 down to fewer than 10. The growth in West Virginia’s natural gas industry has provided new work for the company, and there has been some level of new coal-related activity in 2017. That work has allowed the company to build its employee base back up in 2017 to approximately 20. However, the slow-down in coal left few resources for positioning the company for a more stable future. The U.S. EDA’s and the State of West Virginia’s investment in ScaleUp West Virginia allowed the West Virginia Manufacturing Extension Partnership (WVMEP) to help Progressive Industries find new processes efficiencies, ways to reduce the company’s energy costs, strategies for replacing aging computer equipment, and to establish a more effective online presence. Ms. Cyphert says WVMEP’s value-stream mapping work delivered critical help in optimizing the company’s workflow and employees’ roles. Ms. Cyphert says those efficiencies have played an important role in allowing the company to add employees. 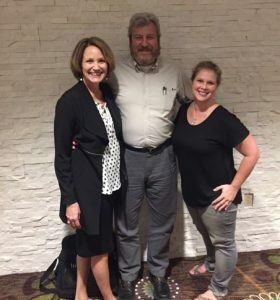 (l-r) Anne Barth, Executive Director of TechConnectWV, Jerry Biser, Director of WVMEP, and Heather Cyphert, owner of Progressive Industries and Precision Tool. Progressive Industries’ sister company, Precision Tool, targets its machining services to a broader range of industries. However, for several years, approximately 90 percent of Precision Tool’s work came from Mylan Pharmaceuticals’ Morgantown manufacturing facility. Progressive Industries’ experience through the coal industry’s downturn made clear the importance of having a more diverse customer base. Customers look for assurances that a manufacturer has the production and management standards and processes in place that will allow them to deliver the same high quality service or product on every order. ISO certifications are considered to be the gold standard for demonstrating a manufacturer’s commitment to maintaining the highest quality production and management processes. The U.S. EDA’s and the State of West Virginia’s support allowed WVMEP to lead Ms. Cyphert and her employees in gaining an ISO 9001 certification. That work covered the full range of quality standards-related items, including conducting a gap analysis and management strategic planning, internal auditing training and creating written procedures for all quality-critical elements in the company’s processes. That is a level of quality control and management that Precision Tool had never thought possible prior to WVMEP’s offer of assistance through ScaleUp West Virginia. It would not have been possible without support from the U.S. EDA and the State of West Virginia. Looking at the full body of work that WVMEP did for both Progressive Industries and Precision Tool, Ms. Cyphert said none of it would have been possible but for the ScaleUp West Virginia program.